About: Acidum Project (Brazil) was founded in 2006 as an art collective in Fortaleza, Brazil. Currently featuring the vibrant work of Robézio Marqs and Tereza Dequinta, Acidum promotes experimentalism through a matrix of urban art like murals, graffiti, design, stencils, photography, stickers, tattoos, audio visual projects and exhibitions. Marqs and Dequinta use mixed techniques to transform their dreams into artwork filled with vivid color, brilliant patterns and obscure characters. They subvert the notions of space, creating art in areas that may be considered unusable or sterile, creating micro-universes for the viewer to explore. Links: Here’s a look at Acidum Project’s Instagram page. About: AIKO was born and raised in Tokyo before moving to New York City in the mid-1990s. She works in the studio as well as public spaces. She is acclaimed in the contemporary art world and well-respected within the international graffiti and street art scene. Her large scale works indoors and outdoors are installed in many cities, including Miami and New York City. Links: Here’s a look at Aiko’s Instagram page. About: Known as one of the Godfathers of Stencil Art, French artist Blek le Rat’s work served as one of the inspirations for artists like Banksy and Space Invader. Born Xavier Prou, Blek adopted his pseudonym “Blek le Rat” from an Italian comic called “Blek le Roc.” Blek began stenciling images of rats around the streets of Paris. Blek’s work is often centered on creating images that make the viewer stop and think. Although the art scene in Paris hasn’t always accepted the validity of his work, the global urban art scene has. Links: Here’s a look at what he’s been up to lately. About: Cooper is a documentary photographer who has specialized in shooting graffiti and street art for more than thirty five years. Her books include “Subway Art, a collaboration with Henry Chalfant,” “R.I.P. : Memorial Wall Art, Hip Hop Files 1980-1984,” “We B*Girlz, Street Play,” “New York State of Mind,” “Tag Town,” “Going Postal” and “Tokyo Tattoo 1970.” She lives in Manhattan but can frequently be found at street art festivals worldwide. Links: Here’s a look at Cooper’s Instagram page. About: Diaz is a painter and urban muralist known for his chimerical and dreamlike depictions of animals in a state of metamorphosis. 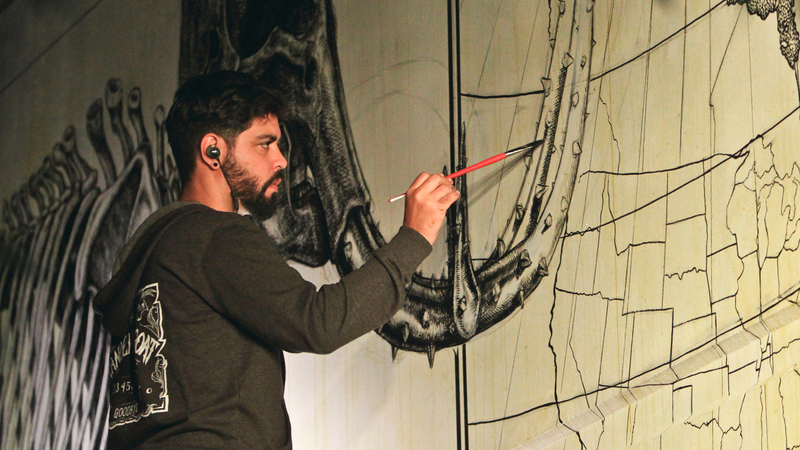 Inhabited mostly by phantasmagorical animals, Diaz’s captivating murals are characterized by a detailed technique and line-by-line precision. Diaz’s signature style is the use of tiny black brushstrokes on white to render his creatures, making them look like highly-detailed pen-and-ink drawings. Links: Here’s a look at Diaz’s Instagram page. About: The Argentinian artist, known as JAZ, originally trained in scenography (the design and painting of theatrical scenery) and became one of the leaders of graffiti writing in Buenos Aires during the mid-1990s. JAZ is best known for his large scale murals and often portrays elements of the social and cultural environment of Latin American in his work. 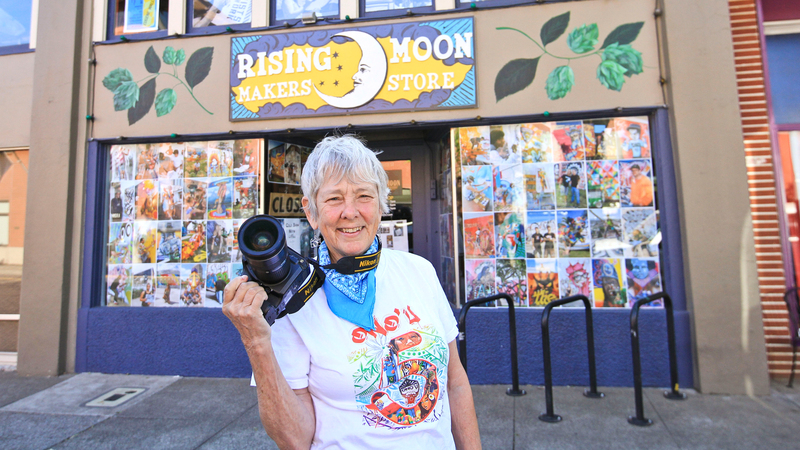 About: Bayne Gardner is a self-taught visual artist living and working in the Eugene-Springfield area. Lately he has focused on painting public and private murals. Though he usually works solo, he has also directed numerous collaborative projects involving children in the painting process. Inspired by motion in nature, Gardner brings a lively and spontaneous energy to everything he paints. Links: Here’s a look at Gardner’s Instagram page. About: Hassani, is a lecturer at Kabul University, the largest college in Afghanistan. 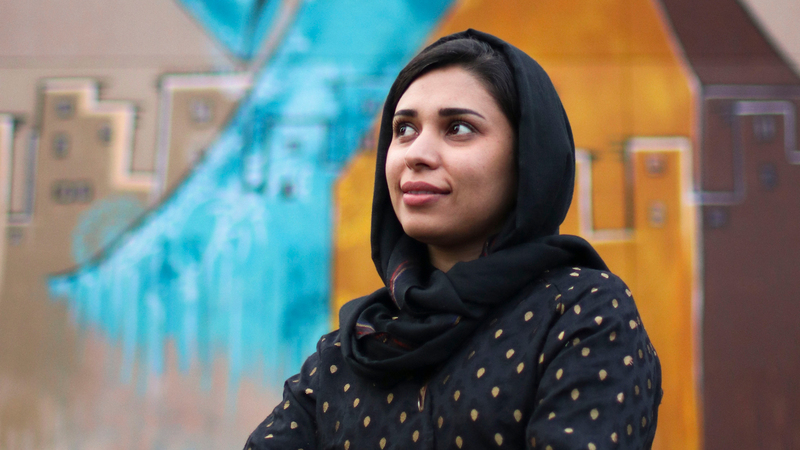 She’s the country’s first female graffiti artist, and through her artwork she portrays Afghan women in a male dominant society. The woman character used in her artwork shows a person who is proud, loud and can bring positive changes to people’s lives. Links: Here’s a look at Hassani’s Instagram page. About: Currently residing in London, Hush’s style draws upon elements of Japanese influence, including anime and geishas. His approach combines traditional artistic techniques and street art style, creating a dynamic blend of graphic elements and abstract pop. About: Born in Argentina and now residing in Valencia, Spain, Hyuro is best known for surrealist and sometimes whimsical approach to her subjects. Her work embodies a sense of eerie playfulness by blending thematic issues of politics, nature and feminine identity. Links: Here’s a look at what she’s been up to lately. About: Lopez is a painter influence by hip-hop culture and graffiti art. 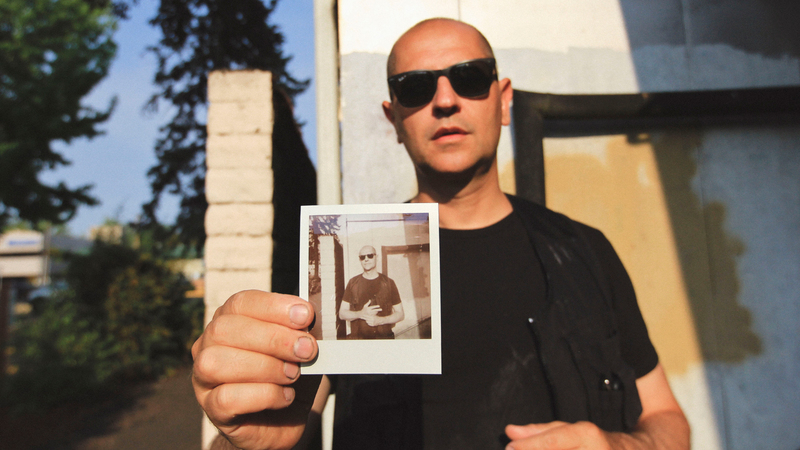 Although he emerged from the graffiti subculture, the academic influence gained through earning his Bachelor of Arts of fine art from the University of Oregon resonates through his work. Lopez studied under the guidance of master sculptor Dora Natella and design theorist Leon Johnson. Lopez seeks to discover the possibilities of utilizing wildlife as a stage for human interpretation. Using a variety of dynamic colors, Lopez explores his own calm protective nature as well as his volatile relationships with his subjects, producing pieces that are powerfully vibrant and, at the same time, complimentary. The result is a series of works that articulate the essence of the creative process. Lopez currently works and lives in Los Angeles. About: Kiran Maharjan (H11235) is a street artist and muralist whose works revolve around the dual nature of mankind and of the artist. 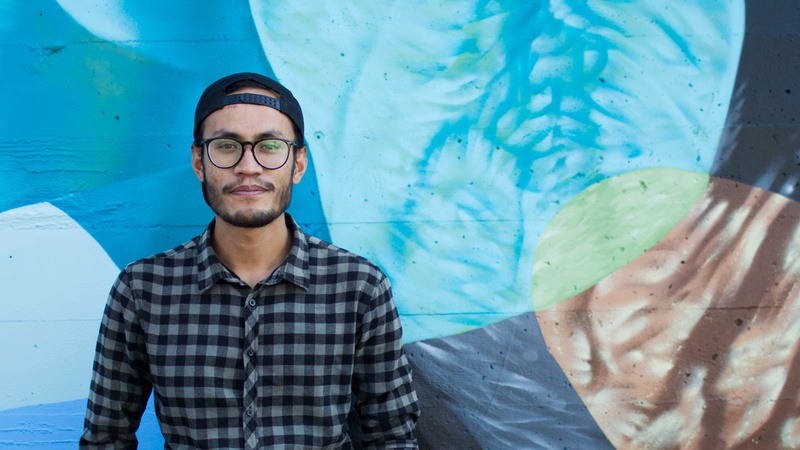 Maharjan completed his BFA degree from Kathmandu University Centre for Art and Design in 2014. His work can be seen in the different streets of Nepal and countries like Denmark, Finland, Cambodia and India. Links: Here’s a look at H11235’s Instagram page. About: Ila Rose is a painter, hailing from Eugene Oregon. 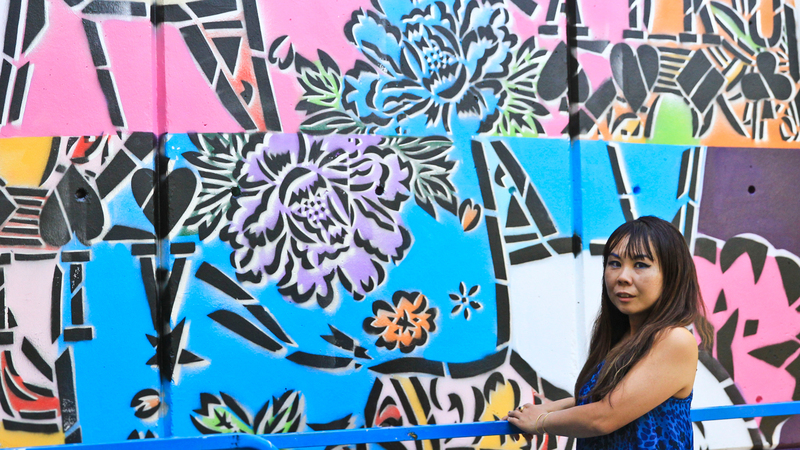 Rose’s first public mural can be seen in the Whiteaker at Fifth Avenue Alley and Blair Boulevard. She is inspired and humbled by those who have formed close relationships with the earth. Instances of this human-environment interconnection are rich with shared symbolism. Symbols that echo throughout time and space have instinctively landed themselves in her art. About: Matthew Small is a British artist who focuses primarily on painting portraits. 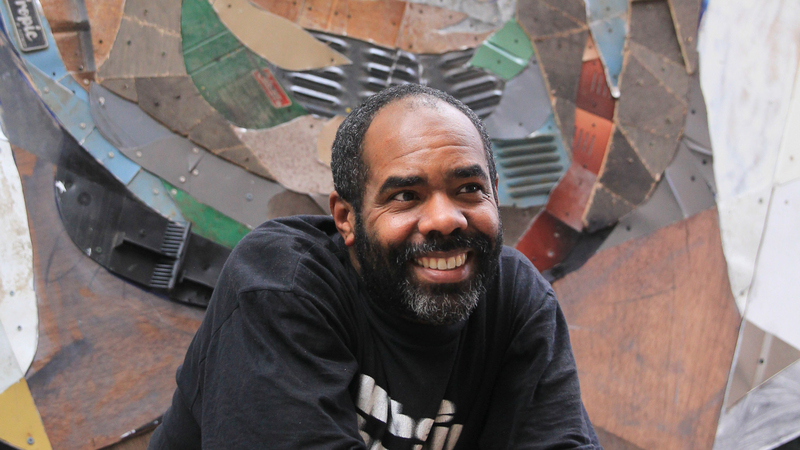 Where Small diverges from the classic painter, though, is he creates his pieces using reclaimed and found items in the community, using metal objects like old fridges, other household appliances or even parts of wrecked cars. His portraits are meant to draw attention to the diverse and dispossessed. His final pieces are of the city and consist of things society has forgotten. Links: Here’s a look at Small’s Instagram page. About: Stanton lives in Brooklyn, N.Y. and draws his inspiration for his big-wall art from historic ornamentation, religious iconography and classical painting. He does everything from large-scale installations to stained glass, mosaics and multimedia animations. His most recent project was a month-long animated installation titled “Voyage” as part of Midnight Moment in Times Square in downtown Manhattan. 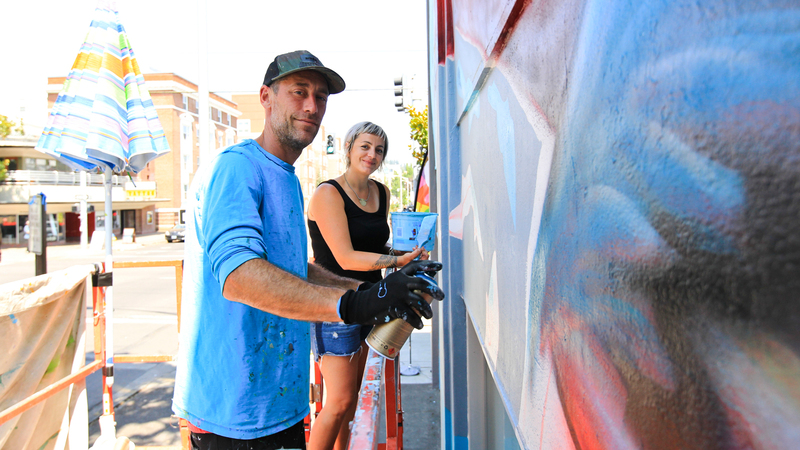 Links: Here’s a look at the other murals Stanton has done. About: Dutch artistic duo, Telmo Pieper and Miel Krutzmann — known as Telmo Miel — have worked together since meeting at the Willem de Kooning Academy in Rotterdam, Netherlands in 2007, and officially became Telmo Miel in 2012. Balancing somewhere between surreal and realistically rendered, their murals embody an immense attention to detail and vivid color. Links: Here’s a look at what they’ve been up to lately. About: Born in 1991 in Foshan, Guangdong province, Tunan’s street-art style combines traditional Chinese art with Western graffiti through the use of action and splatter painting to create bold compositions of animals. Links: Here’s a look at Hua Tunan’s Facebook page. About: Born in Chicago, Illi. in 1957, Witz has been consistently creating art since the late 1970s and is considered to be one of the pioneers of the street art movement. Currently residing in Brooklyn, N.Y. Witz is well known for his street art but his artistic repertoire also includes painting, photography, graphic design, film, books and other publications. About: WK (WK Interact), from France, has lived and worked in New York since the early 1990s. WK is interested in the human body in motion and his paintings of figures frozen in a flight of movement reflect this. The artist’s unique process involves a technique of twisting an original drawing or photograph while it’s being photocopied, resulting in the monochromatic palette and streamlined moment-in-time appearance of his finished work. Links: Here’s a look at WK Interact’s Instagram page.